I was at the market just as the snow from the latest Nor’Easter was starting to fly in earnest. I was ostensibly there just for bread, but saw this beautiful crown of broccoli in the produce aisle, and one of Peg’s favorites, Cream of Broccoli soup, came to mind. Peel the broccoli stems if necessary. The fiber does not break down nicely. After cutting the broccoli and onion, put them in a stock pot with the water. Cover and bring to a boil. Lower the heat and simmer for 10 minutes or until broccoli is tender. The onion will be tender by that point as well. I used an immersion blender to break down the vegetables, then added the chicken base, salt and pepper, then let the mixture cook for a while longer. When ready to serve, stir in the sour cream and half & half. Add very little nutmeg – just enough so you can almost taste it. Adjust salt & pepper. Yeah, that’s a mouthful. But a delicious mouthful. 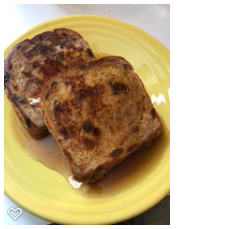 For years I have been sporadically buying cinnamon-raisin bread at the supermarket, just for making French Toast. I would occasionally stuff the French Toast with cream cheese or something else, but I was distracted by a jar of Nutella. If you haven’t heard of Nutella, it’s a hazelnut and chocolate concoction about the consistency of peanut butter, and it’s just delicious. Beat the egg in a shallow bowl until it’s well beaten. Add the milk and mix well. 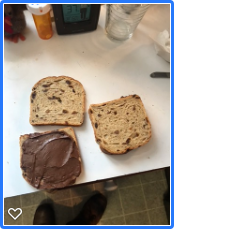 Spread Nutella on two pieces of bread, and cover with two more slices, ending up with two Nutella sandwiches on raisin bread. Already a good start. Dredge the sandwiches in the egg mixture, both sides, and transfer to the skillet. Cook for about two minutes, until golden brown, then turn and cook the other side to golden brown. Serve with syrup. More butter optional. A sprinkle of powdered sugar will make it a bit prettier, but doesn’t really do much for the flavor. Yes, this is different from the other recipe – simpler and easier to make. Looking at the lead times of ingredient preparation, I usually start with the potatoes. Peeled and diced to about 1/2″, the potatoes are put on to just boil – we want them tender, but not already cooked through. While the potatoes are cooking, dice the onion and ham. The ham should be about 1/2″ dice as well. When the potatoes are ready, drain them in a colander and put the pot back on the burner. Melt the butter and saute the onions until just tender, then stir in the flour and mix thoroughly, and cook this roux for about two minutes. Whisk in the water, then mix in the corn and ham. Bring this mixture to a boil for two minutes, then add the milk and potatoes, season with salt and pepper to taste. Simmer until the potatoes are fully tender. Serve with oyster crackers or Saltines. I find that the other recipe, with red bell pepper, really bests this version, but I didn’t have any peppers last night. And this was pretty good. Christmas Eve was coming up quickly, and I was cooking for the DiRusso sisters. It was Feast of the Seven Fishes, an old Italian-American tradition of eating fish and other seafood in celebration of Christ’s birth. I was cooking in a competitive environment, so lobster was certain (witness last year’s Lobster Arancini, or the Lobster Ravioli the prior year). I took it down a notch by not making it all lobster, but seafood newburg would be great – a bit lower cost (scallops were only $16/lb while lobster meat was $40/lb. Shrimp a relatively sane $7/lb). And I’d deal with three fishes right off the bat! In a heavy saucepan at medium heat, melt the butter and add the scallops and shrimp. When the scallops are opaque and the shrimp just turning pink, add the lobster and finish cooking the shrimp and scallops. Add 4T of Sherry and 6T of brandy, and cook the mixture for two minutes. Using a slotted spoon, remove the seafood to a warm plate. Add the cream to the sherry mixture and boil gently until reduced to about two cups. Reduce the heat to low, then add remaining sherry and brandy, the nutmeg, cayenne, and salt to taste. Whisk in the egg yolks and slowly cook the mixture, whisking constantly, until it reads 140°F, then cook, whisking constantly, for three more minutes. Stir in the seafood, and serve seafood Newburg over the pastry shells or cups. Thanks to epicurious & thanks to Gourmet. Thanksgiving was a small affair this year, just Peg (the blog’s namesake) and me. Ordinarily I’d have helped out with a pie or something, but I did the whole shebang today. Turkey, mashed potatoes, stuffing, gravy, roasted brussels sprouts, cranberry sauce, and pecan pie. All very straightforward, most I’ve done before, but I managed to pull it all together, mostly on time. The turkey was a 12 pound Jenny-O, roasted according to the package instructions (325F for about 3 hours and a bit). Four potatoes (about 1.5# were peeled, roughly cubed, and boiled until done (tender by fork and tasted “done”) with 2 T of butter and a splash of milk. I cheated on the stuffing and got Pepperidge Farm Country Style, which is really easy and really good. That was prepared with 4T butter, one can of chicken broth, and about a teaspoon of dried onion. Melted the butter, heated the broth, mixed in the stuffing, and put it all in a casserole which went into the oven a few minutes before the turkey came out. Brussels sprouts I made according to a recipe I found here( and of course I bookmarked it!). I did eliminate the garlic because it’s not Peg’s favorite. This turned out great, by the way! The pecan pie was made according to the classic Karo Syrup recipe which turns out to be the “family secret” after years of everybody raving over my Aunt Glenna’s Pecan Pie. I did forget to include the butter, but it turned out great just the same, making me think the butter isn’t really needed. The pie shell stuck in the Fiestaware pie plate though, so next time it will get sprayed. It doesn’t matter, but I used the dark syrup. 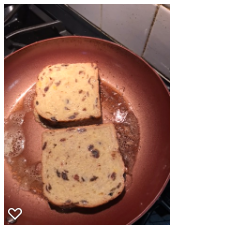 The web site says either will do, and I’ve used both to good effect in past years (and of course I claim the recipe is a “family secret”). Cranberry sauce? Ocean Spray, of course. What else could we serve in Massachusetts? And the gravy was dead straightforward. There was about a cup of drippings in the turkey pan, with hardly any fat. I melted 2T of butter in a saucepan, added 3T of flour, and made a relatively dark roux, then added the drippings and one cup of milk, with a little salt and pepper, and cooked that until it was thickened a bit. I looked around on the internet for recipes to try, and came up with very close to bupkis. So I made something up. All of the stuffing recipes contained onions or shallots, and some bread. Wow. What imagination. The only smart thing they did was to cut a hole through the middle of the roast rather than cut it open and fill it like a jellyroll. Herewith, my take on Stuffed Port Roast. I had a chance to get a sample to Peggy, and I had a sample the following day. Four thumbs up. I think it turned out better than I expected. Dice the shallots, apricots, and prunes, then saute in 1 T vegetable oil until the shallots are tender. Mix with the bread. Dilute the chicken base with the water, add to the stuffing, and mix is all up well. 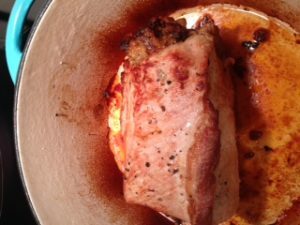 Compress the pork roast from the ends, like a large filet mignon, and with a long knife, stab through the center – lengthwise – of the pork roast. Flip the roast end-for-end and stab again, taking care to align the hole in the roast. Use your fingers to open the hole as wide as possible, and fill the cavity with stuffing. Turn the roast, again end-for-end, and stuff from the other end, until the roast is firmly stuffed. Salt and pepper all four sides of the roast to your liking. Rest the roast, covered, for 10-15 minutes, slice and serve. You can make gravy with the drippings, which are mostly rendered fat if you’d like. For each T of drippings, add 1 T of flour, and cook to form a roux. For each T of drippings, add 1/2 C of milk or chicken stock (made from chicken base, just sayin’), stir and cook until you like the consistency, about 5-10 minutes. For last Christmas, Peg unexpectedly bought me a Dutch Oven, not that we didn’t already have one. This one is enameled cast iron, unlike the plain cast iron models that we also own. So it’s pretty, and very easy to clean. Pour the oil into the Dutch oven and preheat over a medium high flame. Rinse the chicken and dry it with paper towels. Season both top and bottom of the chicken with salt and pepper. minutes or so, until the chicken is browned nicely. Watch it for sticking. While the chicken is browning, you have time to cut and slice the onion. When the chicken is browned nicely, turn it over to brown the other side. Add the onions to the pot, along the sides. Cover the pot and place it in the pre-heated oven for 45-50 minutes. (My first attempt ran 55 minutes and it was a bit overdone). Set a timer. When the timer expires, check the thigh with a meat thermometer. The chicken should reach a temperature of 165F to assure it’s done. Remove the chicken to a plate and let it rest. Pour the onions, fat, and juices into a heat-proof container. Use a ladle to save 3 T of the accumulated fat, and put that back in the Dutch oven. Discard the remaining fat, but retain the other juices. Combine the flour and oil, cooking over medium heat to form the roux for the gravy. When the roux is cooked and smooth, add the onions and remaining juices to the Dutch oven, stirring well to avoid lumps, and cook for several minutes until well-mixed and thickened. If the gravy is too thick, add milk until the consistency is to your liking. A submersion blender may be used to advantage here, but it’s not really necessary. Add salt and pepper to taste. Carve the chicken and serve with the gravy. I think it turned out very well. Peg claims that she’s not going to cook any more. I made deviled eggs again for Easter, and got a lot of compliments on them, so I think I have a final recipe. 1 dozen eggs, plus a couple spares. If they peel nicely, you’ll have too many, but I judge “too many” as more than I can fit in the 20-cavity tray I use. Eggs are best prepared a day in advance . Best if put in the pot in one layer, laying on their sides, with enough water to cover them by an inch or so. I use a liberal amount of salt (as much as 1/4 C) and perhaps a like amount of vinegar. The salt raises the boiling point of water; the vinegar keeps the whites at bay should little leaks evolve. Bring the eggs to a rolling boil, cover, remove from heat, and let stand for 15 minutes. Drain, cover with ice and cold water. The more ice the better. Let them stand for an hour or more, then refrigerate overnight (I don’t have to say “after draining off the water”, do I?). I put them in a plastic bag before putting them in the fridge to limit that “egg smell” that my wife so despises. Peeling the eggs is made a bit easier by banging the eggs around in the sink, gently, for a couple of minutes. 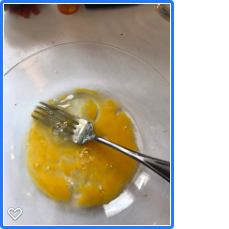 Mash the egg yolks with a fork until smooth. This it the only way. Trust me. The smoother, the better. Mix well, and taste. It might need more salt, or hot sauce. It’s likely too thick. Add 1 T of Miracle Whip, mix, and taste. Repeat adding 1 T of Miracle Whip until the filling is nice and smooth. Spoon about 1 t of filling into each of the egg halves, and garnish with smoked paprika, or a sprig of chive, whatever blows your skirt up. I have been using a 1 qt freezer bag lately. Fill the bag with filling, clip of a small bit of a corner of the bag, and use it to pipe filling into the egg cavities. Neat, clean, far less mess than a real piping bag. Just kind of whipped this together… It went pretty nicely with grilled-cheese sandwiches. Dice the bacon and put it in a soup kettle. Fry it until lightly brown. Drain excess fat. Add potatoes, just cover with water. Bring to a boil, simmer until almost tender. Add corn, bring to a simmer. Add cream, season to taste, and server with Saltines or oyster crackers. Despite the bacon, it’s not at all salty. I’ll be working on this over time.